It’s been an Empidonax-filled late summer here in central Florida, with reports of the little flycatchers coming in about every day so far in the last week or so. I saw two Acadian Flycatchers near where I work and have seen several unidentified “Empids” in my travels around Lake and Sumter, and Brevard Counties. On Sunday, I met up with Camille to check out flycatcher and warbler activity reported at Merritt Island National Wildlife Refuge’s (MINWR) Pine and Oak Hammock Trails [map]. Yes. Warblers. It turns out that the first vanguard of migrant warblers has already been moving through the state, and we managed to get a nice mixed flock or two along the Pine Hammock trail (the Oak Hammock Trail was closed). We had a couple of dozen (!) American Redstarts, and a good showing of Worm-eating Warblers along with Black-and-whites and Northern Parulas. We did not catch the reported Prothonotary or Cerulean warblers that have been reported, however. 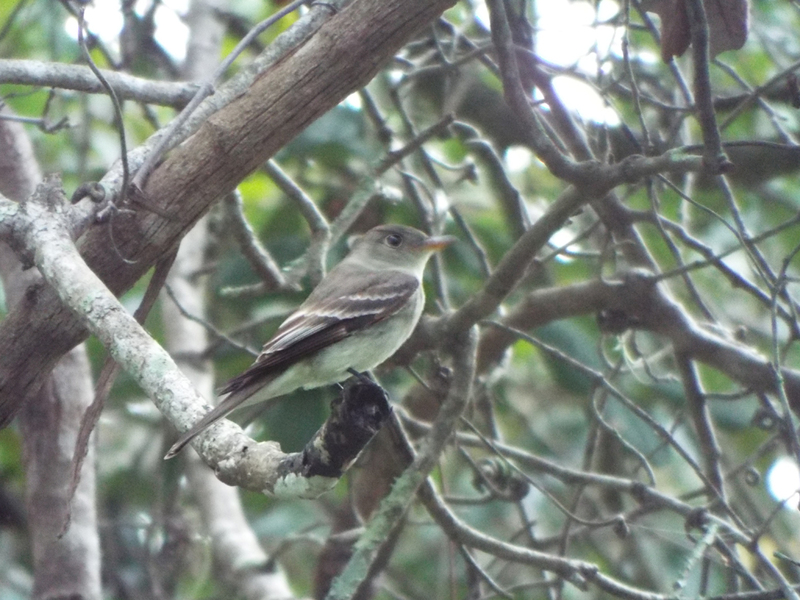 But the star of the day was an Alder Flycatcher (a life bird for me). This species was first reported by Mitchell Harris earlier in the week, and we managed to find the bird on the way out of the trail (well, Camille spotted it and called me back on the trail to her location). At first the bird was quite still and silent (in migration, it is nearly impossible to separate the Empids if they do not vocalize. The visible proportions and field marks overlap too broadly). After watching it fly-catch a few times and change perches, it finally called out a few times, and even answered some limited recordings (yes, I used a recording). The lighting was bad, but I fired off a couple of shots. 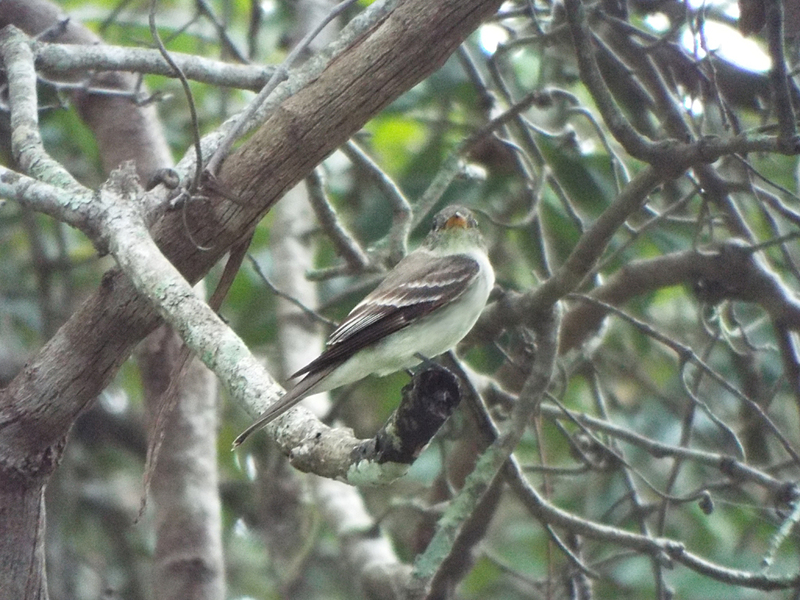 Without vocalization, this bird could almost as easily be a Willow Flycatcher (the most similar) or even any other Empid or an Eastern-wood Pewee. Luckily for us, it did call a few times. Here’s a good view of the orange/yellow underside of the bill that is common to most Empids and Wood-pewees. We finished up the morning by cruising the open part of Peacocks Pocket [map] and East Gator Creek [map]. It was a nice little migration preview, but we’ll have to see how the autumn plays out and if any of this seemingly early movement means anything significant. Posted on 2017 August 28 2017 August 28 by Lonely BirderPosted in BirdingTagged Alder Flycatcher, Birding, birds, birdwatching, Empidonax, Empids, Hammock Trails, Merritt Island National Wildlife Refuge, MINWR.